We upload Shopify shipping information alongside with order payment information. 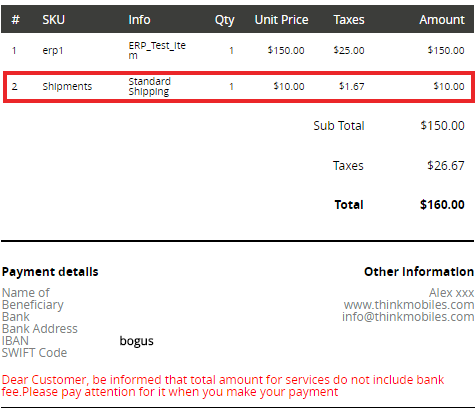 When you form an order you also receive an invoice for it. There you may observe all order-related details, including shipping. You can find it right in the Order details tab, below the information about bought item in a “Shipment” row. It is not possible to synchronize it any other way. There you can find the information on shipment type and its price with already included taxes. Sure thing, you can find the included cost of it in summarized price of the order as well. You can synchronize shipping methods in EasyERP with those available at your Shopify store. They will be uploaded from your Shopify store and only this way. You can not upload your shipping methods from EasyERP to your Shopify store. After synchronization, they will be available in EasyERP. After the synchronization, you can find those shipping methods in Shipping methods tab in Settings/Product configurations. There you are able to customize them with ease as you wish. Also, information about shipping method updates in Shipping methods tab in Settings/Product configurations, so afterward this type of shipping will be available in EasyERP as well. This function is present you can use it in your future transactions as one of default shipment types. So as you can see, we did our best so your dealing with shipping methods on both sides could be as convenient and pleasant as possible. Hope you’ll find them tremendously useful as well.